Wikipedia has a nice write up of the game scene, although it is a short article, they also have a nice list of tabletop RPGs by genre. I wonder if Gear Antique Renaissance is still available? 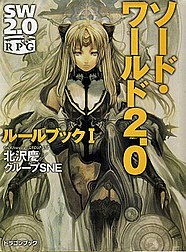 Sword World 2.0 was published in 2008 and is still popular. Heh, they only use six siders, poplyhedrals are not common. Class/Skill systems are old hat in the American tabletop scene but it has its advantages. Sword world RPG’s classes are called ginou (技能 lit. skill?). Each ginou has packaged a number of skills. It is considered as a hybrid system between class system and skill system, so it is often called class-skill system. There are 8 classes (Bard, Fighter, Priest, Ranger, Sage, Shaman, Sorcerer and Thief) for Player Characters and 2 classes (Dark Priest and Dragon Priest) for only NPCs. 5 major races (Human, Dwarf, Elf, Half-elf and GrassRunner) can become PCs. The game uses only two 6-sided dice, as other polyhedral dice aren’t common in Japan. 2d6 dice roll is translated into a more wide range of random numbers by using a Rating table. The Rating table is used for damage roll, damage reduction roll and such. The official Japanese web site of Sword World is here.